First cut a 6" x 9" piece of Stampin' Up! Blackberry Bliss card stock and fold it in half for the base, a 4 1/4" x 5 3/4" piece of white for the front layer, a 1 3/4" x 5 3/4" piece of designer paper for the strip, a 3 1/4" x 3 1/4" piece of Blackberry Bliss for the image background and a 3" x 3" piece of white for the image. Then dry emboss the front layer with a Stampin' Up! Honeycomb embossing folder then attach the strip of Stampin' Up! Painted Blooms Designer Series Paper and set it aside. Then using a stamp positioner, stamp the leaves on the 3" x 3" piece of white card stock with Stampin' Up! Pear Pizzazz ink then the flowers and sentiment (I used a stamp from my Stampin' Up! Bloom with Hope set) with Blackberry Bliss ink. Next stamp the butterfly on a piece of scrap paper with a stamp from the Stampin' Up! 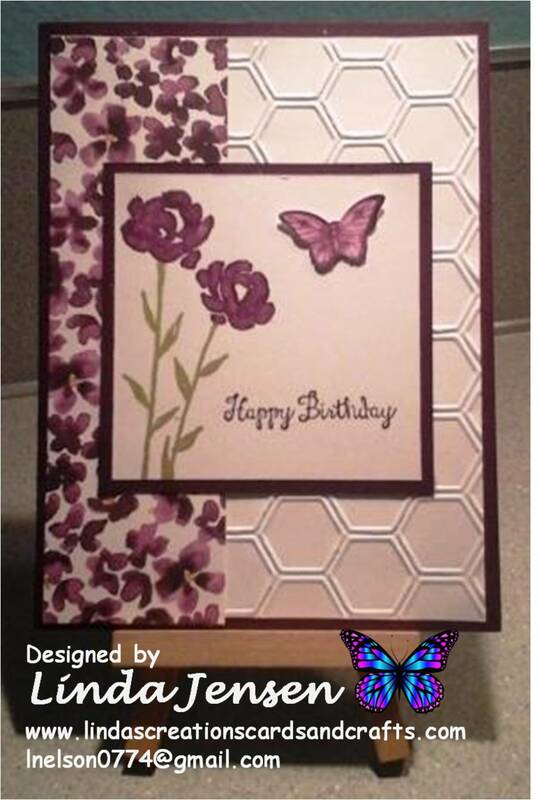 Papilion Potpourri set with Blackberry Bliss ink and punch out with a Stampin' Up! Bitty Butterfly punch and attach with a mini pop dot. Finally assemble the card and enjoy!